Limited edition and personalised automotive art prints are created by Alain Lemire for car owners, collectors and fans. They may be done in factory or custom look, to match the customers ride or 4 wheels dream. Lemireart is using high end archival printing technology for a better conservation in time. 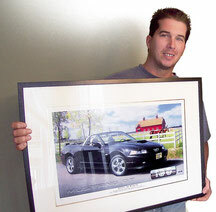 Automotive portraits have been sold mostly in the USA. Customers are also located in Canada and in Europe. 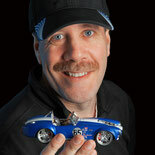 To see more automotive portraits and read stories about Lemireart's work, visit the links below. Lemireart is offering automotive portraits since 2003, first from Ebay and since 2015, from also this website. We also offer a 14”X20” owner print with the car VIN and owner name written on the print. Personal touches like custom wheels, tire lettering changes, custom body color and stripes may also be done with extra cost. 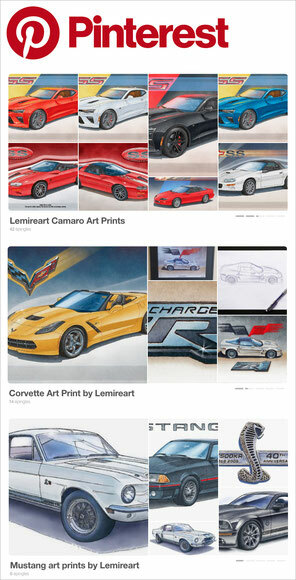 The top left picture shows a proud 2004 Mustang GT 100th Ford anniversary special edition owner holding the framed print deliver by Lemireart. We added the 100 years of Ford logo on the print to custumize it to match the car feature. It’s possible to order some of those auto print online right here, on this web site.